I’m currently working on a couple projects so I thought I’d share them here. First – socks. 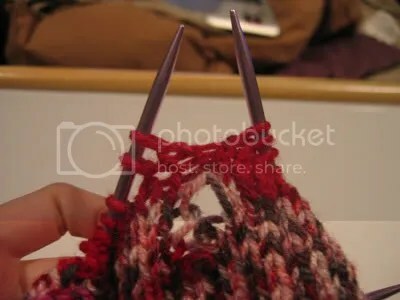 I’ve always been intimidated by their complex shape, so I never thought about trying to learn how to knit them. 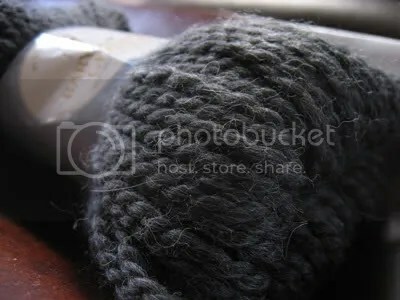 I probably would have put it off even longer but my local yarn store had a sale (because, unfortunately, they are closing down) and I bought some nice wool sock yarn on discount. But I didn’t want to have my first sock attempt on nice wool, so I bought some cheap acrylic yarn at Michael’s and followed an online tutorial. Things started out well. I made the cuff/ankle part without any problems and even turned my first heel! But then, disaster struck as I started the gusset and I noticed some wonky stitches. When I tried to drop and repair them, things only got worse. 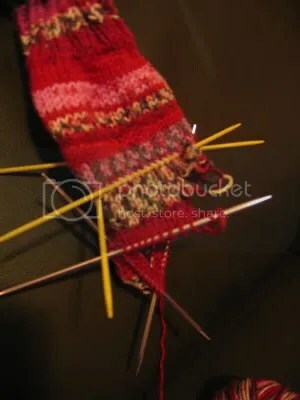 I realized I would have to rip out a bunch of my progress and redo part of the sock. 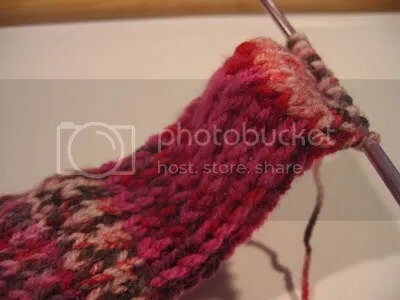 I was really nervous about this because I’ve never unraveled a three dimensional knit piece before and I wasn’t sure I’d be able to catch all the stitches… Here’s a pic of my sock operation. Luckily the fix went well and I’m almost done with my first sock. I’ll post pics when I’m done! Second is a project is a winter hat for my husband. I already tried making him another hat that ended disastrously. It basically ended up being way too big and floppy and wound up looking like a toilet seat cover. This time, I’m using my favorite yarn: Plymouth Yarn’s 100% Baby Alpaca Grande. It’s so wonderfully soft! I’ll post pics when that’s done as well. Bernadette is about to start college but she has no idea where she wants to go with her life. Having a powerful lawyer for a mom pressuring her to get into an Ivy league school isn’t helping matters, either. When Bernadette discovers and befriends a bizarre group of people in her neighborhood, she soon gets swept up in the joys and pains of the needle. The knitting needle, that is! It turns out there’s a local yarn shop with a wacky, weekly knitting club. And it’s more zany drama than she ever could have imagined. But what will Bernie’s ultra-feminist mom say when she’s discovered participating in the dreaded domestic arts? The synopsis is likely going to be tweaked to reflect the weirder, wackier nature of the story. Originally, I planned the story as a slightly more serious drama about a girl trying to figure out her place in the world and how she deals with pressure from her mother. But I’m always writing stories like that and I wanted to just throw all seriousness out the window and just make a really funny, irreverent comic with the same broad theme, but taking itself less seriously. I may even end up changing the title. Below is a sample page I did a while back when the comic was more serious. 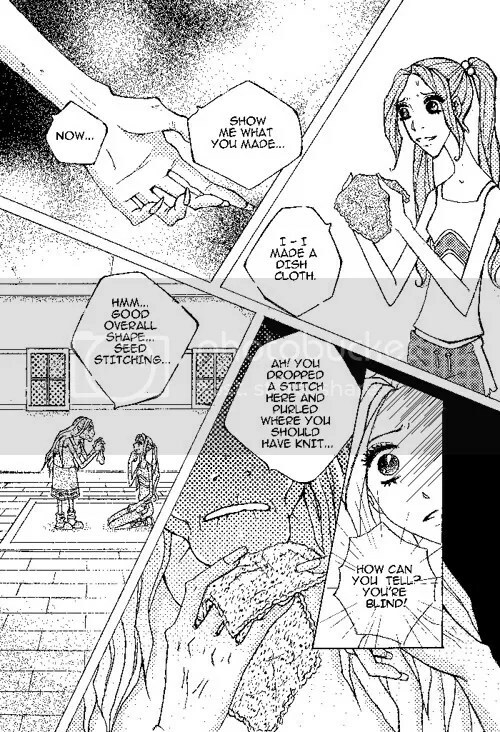 This scene won’t even be taking place in the current story – but I thought I’d share it anyway. And here is one my favorite characters from the story – Sangria. 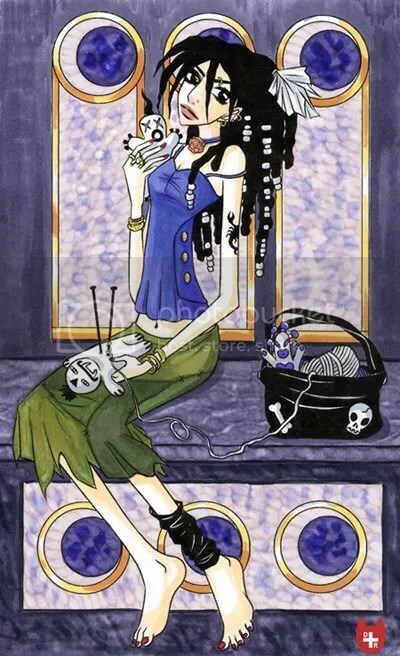 She knits voodoo dolls and uses her knitting needles to inflict punishment!